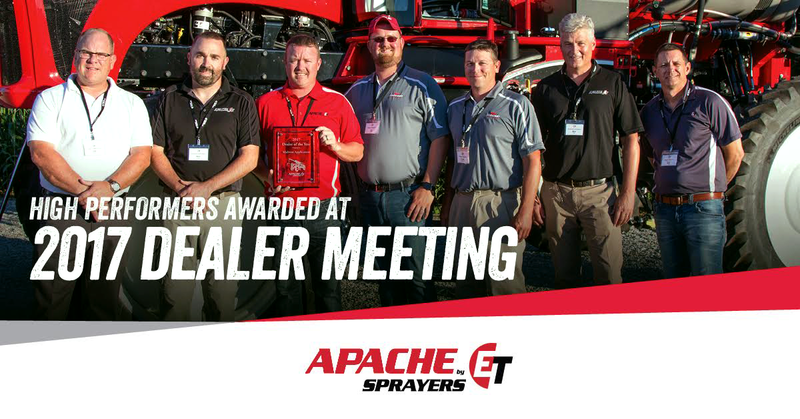 MOORESVILLE, Indiana (September 6, 2017) – Equipment Technologies, parent company of the Apache Sprayer brand, celebrated its dealers at the Annual Apache Dealership Meeting, July 25-27. The event which was held at company headquarters in Mooresville, Indiana, recognized individual salesperson and dealership awards, showcased updates to current sprayer models and highlighted future innovations. Dealers also participated in informational breakout sessions and workshops during the two-day event. ET Works is a manufacturer of self-propelled sprayers. Headquartered in Mooresville, Indiana, ET creates Apache Sprayers and Bruin Sprayers for distribution throughout the United States, Canada, Australia and C.I.S. Learn more about Apache Sprayers at apachesprayers.com and Bruin Sprayers at bruinsprayers.com.